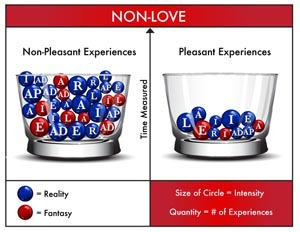 It is impossible to measure each pleasurable and non-pleasurable experience along with its respective quality and intensity, every second, for all the love relationships that exist in your life. However, it is possible to produce a snapshot of how you perceive your love relationship by calculating its Love Quotient. Love Quotient is a tool created to help you build stronger love relationships and to provide you with insight into the gap between real and fantasized love. The objective is not to reduce love to a score, but to get a better grasp on how you perceive your relationship and encourage open, honest communication. By understanding the ingredients that compose love, motivated couples can work to improve their love relationship. This is an intimate exercise; do not share scores with anyone other than your loved one. Dialogue with others is encouraged to learn from and help you with ideas on how to improve ingredient scores with your loved one - but actual scores should remain private. BEGIN any day keeping in mind you will most likely assign more positive scores on a happy day and more negative scores on a gloomy day. A typical day may provide the most relevant score, but extremely happy or upsetting days may provide deeper insight into certain ingredients. Either way, it doesn't matter since you are interested in the longer term Love Quotient, not the initial score. As you continue to make entries, the initial score will average out over time and the Love Quotient will become a better representation of how you perceive your love relationship. The more entries you make, the clearer picture you will get. Get into a habit of making a daily entry for any experience affecting an ingredient, whether it was pleasurable or non-pleasurable. You will need a pen and paper OR you may use a electronic spreadsheet. Step 1: Assign each of the 7 ingredients one of the following scores; -5, -4, -3, -2, -1, 0, 1, 2, 3, 4, 5. 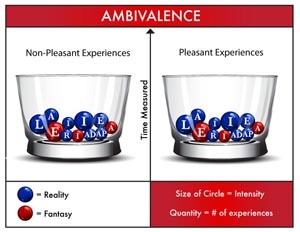 Use a negative score to indicate a degree of non-pleasure, use 0 to indicate ambivalence and use a positive score to indicate a degree of pleasure. *Be honest with yourself. You should only give a score of +5 if you cannot think of anything else that your loved one can do to satisfy you more for a particular ingredient. List what is not present, or does not meet your satisfaction for each ingredient. Remove a point for each item on your list starting with +5. For example, if you have 3 items, you would score +2. The list can be used to explain your scoring criteria to your loved. Nothing is set in stone; you can always edit your list as you go along because it is what YOU perceive as important that matters. YOU determine the score you feel your loved one deserves for each ingredient (not what your loved one thinks they should score). Add each ingredient score and determine your total score. The minimum total score possible is -35 and the maximum is +35. The result is the initial Love Quotient you calculated for your loved one. A negative score indicates that you do not perceive love at the moment. Step 2: On separate paper, repeat step 1, however this time, score each ingredient how YOU think your loved one should have scored you. Step 3: Compare Love Quotient scores with your loved one. The closer the score you gave yourself in STEP 2 is to the score your loved one gave you in STEP 1, the more your love relationship is based on reality. The further apart the scores are, the more your relationship is based on fantasy. Step 4: Discuss the variances and clearly communicate to each other what you consider a +5 would be for each ingredient BEFORE you begin STEP 5 (INTOX). If your loved one brought up any issues that you may have forgotten and agree with, feel free to alter your score (only if YOU feel you should). Step 5 (INTOX): Each day, for the next 28 days, you and your loved one will both work on the same ingredient and score it daily, starting with Affection. Score your loved one on how you feel on that day, even if the score remains the same. Over a 28-day period, you will score each of the 7 ingredients at least 4 times, focusing on one ingredient per day. Consider the quantity, quality and intensity of the experience when you are scoring an ingredient. If you don't feel an effort was made that day for an ingredient, score it 1 point less than what you scored it on the initial Love Quotient. Communicate your score and its reasoning daily to open up the communication channel. This will allow your loved one to hone in to your specific needs and do better as time goes by, building a stronger love relationship along the way. Add up all 4 scores for each ingredient. Divide each total ingredient score by 4 to get average score. Compare the INITIAL Love Quotient and the INTOX Love Quotient to determine if there has been any change. A. ACCEPT - by accepting what your significant other is requesting from you, an intense pleasurable experience will be added in your relationship. B. REJECTING - by rejecting what your significant other is requesting from you, an intense non-pleasurable experience will be added in your relationship. This may result in your significant other seeking satisfaction of the request(s) elsewhere. C. COMPROMISE - by partially satisfying what your significant other is requesting from you, a less intense pleasurable experience will be added in your relationship. This may result in your significant other seeking complete satisfaction of the request(s) elsewhere. Step 6 (MAINTAIN): Ideally you should work on an ingredient each day, focusing on weaker ones first until they even up with the others. The more frequently and creatively you work at each ingredient, the greater the accumulation of pleasurable experiences. With pleasurable experiences accumulating faster than non-pleasurable experiences, your love relationship will continue to grow stronger, provided both you and your loved one remain committed to continuously work at it. Remember: life changes and people change. No one in a mature relationship should have a perfect score. A perfect score is a danger zone, where the relationship will become boring and stagnant, or both of you become complacent. Do not assume that the relationship that is great today will be great tomorrow. Make it a habit to periodically re-examine each ingredient. OMADAMO can help you move from the fantasy of love to a dynamic love reality, so that you can encourage and share in one another's growth, and development. Together you can then adapt to a transforming world, while supporting one another in good times and bad. Remember, too, even if you initially score high with certain ingredients, there will always be creative and enjoyable ways to work on each ingredient. This is why the author recommends to never give a +5 score for any ingredient, as a constant reminder of the endless possible experiences that exist if we apply ourselves and engage our creativity. Like maintaining a healthy weight, growing and maintaining love requires discipline, effort and math--except with OMADAMO, you count experiences...not calories.